When I was a kid, we always wore African print clothing during Black History Month at church. It was meant to be a bold expression of Blackness, of pride, of identity. And while I didn’t fully understand the point of it all as a child, I found myself participating in the same ritual this month with my own family. Except, we weren’t going to church. We were going to see Black Panther. We were going to Wakanda. And in many ways, this was a grander display than I ever remember from my childhood. We weren’t going to a Black place of worship, we were going to a public space, fully aware that the white gaze would inevitably be on us. Still, our invested pride in a film we’d only glimpsed in 30-second trailers led us to behave just like those Sunday morning services I remember. With the premiere of Black Panther, black folx across the nation declared “we belong” with #WeAreWakanda, identifying with a movie literally bursting at the seams with Black star power. The gag is: Wakanda wouldn’t want us. I, like most of Black America, couldn’t wait for Black Panther to drop. As a long-time comic book fan, the fact that the Black Panther was finally getting the film treatment he deserved was like the culmination of all my impossible boyhood dreams becoming reality. And Black superheroes serve a far greater purpose than their white counterparts. 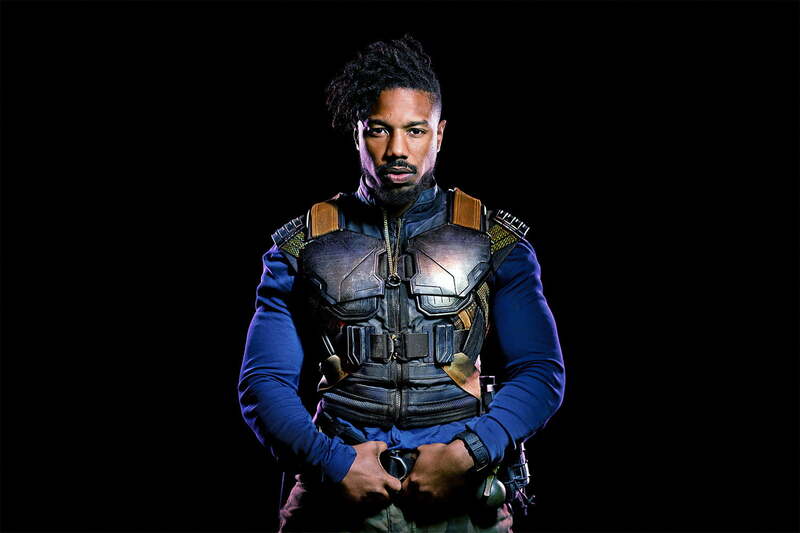 But much to my surprise, the far more interesting lead character in the film was its antagonist, Erik ” Killmonger” Stevens aka Prince N’Jadaka. In many ways, Michael B. Jordan’s “Erik Killmonger” stole Black Panther like Chadwick Boseman’s “T’Challa” stole Captain America: Civil War. His brute force of a presence on screen was beautifully nuanced, especially in filling the villain role. But most importantly, he was a symbol of Black America in a film that was ostensibly filled with African diasporic characters. An important distinction. But when he enters that room, he is laughed at. He is dismissed. Even though T’Challa knows who stands before him, he continues to carry on the lie that his father forged. He clings to a sense of duty over tradition, justice, decency, and humility. But even in his admission that he should be helping us, he stops short of acceptance or acknowledgment of our linkages. At no point does T’Challa publicly admit the sins of his country’s past or even try to atone for them. For all of Killmonger’s efforts to get what he deserved, a lifelong battle on his part, he is ultimately killed, cast aside, and forgotten in service of the banner of Wakanda. To the nation, he is another disposable Black body, only allowed to see the beauty of his homeland in death. We’re not Wakanda. We are Prince N’Jadaka. We are Erik Stevens. #WeAreKillmonger. Often vilified. Often misunderstood. And often shouted down by those in power. We are Annie, waiting for our parents to retrieve us from the orphanage, each day singing “It’s a Hard Knock Life” and “Tomorrow”. We’ve sung those songs for so long, molding and transforming them from spirituals to scats, from tribal beats to riffs and runs, from hymns to bars or rhymes. But always singing the same songs. And we thought T’Challa would be our Mr. Stacks. When I was a teenager, my parents enrolled me in a Rites of Passage program meant to foster pride, bolster academic excellence, and instill traditional African principles into young Black boys. One of the points that were driven home over the course of months of Saturday morning meetings was to know who you are. And not just who you are today, but also where you came from. That of course meant allusions to Africa, highlighting everything from royalty to mathematical excellence, and understanding the gamut of adversity we have had to face on this continent. The aim was to identify who we are with our origins and use the oppression as proof of our inherent greatness instead of what we have faced. Watching that question be posed in such a powerful manner throughout Black Panther brought me back to those days. I knew early on that the program was not a good match for me, and looking back now, I see it for the litany of problematic aspects at its foundation. But one area where they got it right was that Black folx aren’t just one thing. We are not just from Africa. We’re not just former slaves. We’re not just athletes or musicians or janitors or teachers or ballerinas or hustlers. We aren’t stagnant or stationery. We are a people on the move, constantly evolving, getting infinitely closer to greatness. And we shouldn’t need the fictional African nation of Wakanda to affirm that. We have to face the fact that we continue to be a homeless nation. We have been grappling with this truth since the moment the first of our ancestors were brought to American shores. It’s why our culture is a multifaceted patchwork of disparate elements, uniquely woven together in ways only we can, yet completely elusive to any bounding definition. In short, we are not Wakanda. We are something else that is just as majestic, awe-inspiring, durable, brilliant, and otherworldly as vibranium. And we should be ruthlessly endeavoring to find pride in that.